Should We Just Throw All Unfaithful Debtors in Prison? Up until the early 1800’s, if you were found guilty of not making good on a debt, you could be thrown into debtor’s prison. Even signer’s of the Declaration of Independence (James Wilson and Robert Morris) were incarcerated for their indebtedness. Today, the practice of throwing people into prison is largely unheard of. However, some states, still allow debt collectors to get arrest warrants for debtors in default when their collection efforts have failed. And, according to this same Wall Street Journal story, one county in Oklahoma issued about 1,500 debt-related arrest warrants in 2010 alone. 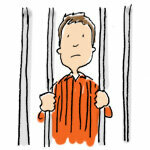 Which makes you wonder: Can imprisonment help to change a debtor’s habits? Well, I think it would be beneficial to define debtors. With many in the US are in debt already (not to mention the country itself) – I think it’s important to make a determination between those who are the “faithful” debtors vs the “unfaithful” ones. I think I would be all for the habitual, debt-racker-upper, who ignores debts and pays when they feel like it to be thrown in jail for a night or two or three.. But not for the one who’s taking responsibility of their debt and paying them off as best they can. Indebtedness doesn’t just affect the debtor – but can affect many other people. While many will argue with this, I believe the Great Recession was a result of people irresponsibly taking on more than they could afford. And, you might say, the current financial climate is owing to this fact. Let’s face it, no one wants to go to jail (well, some might – but that’s another post). With the consequence of not making good on a debt and jail time – I’m sure more people would be motivated to do the right thing. What are your thoughts? Should there be jail time for those who are habitually in debt and are not paying up? Personally, I think there are just too many variables. My wife defaulted on her car before we got married. She never paid a single payment. She couldn’t; it was twice as much as the car salesman had assured her it would be-a number that was already at the top of what she could afford. Case #2, my college roommate would up getting arrested while we were in college. While he was in jail, his student loan grace period ended and he started owing student loan payments. Not something he could afford while making 55 cents per day, and no way of calling for a forebearance. He defaulted on his student loan. Under a debtor’s prison system, he would have had to go to jail for not paying a debt while he was in jail! Yeah – it’s definitely controversial. But, interesting to think that it was instituted in the past as a punishment for negligence. If we are going back to having a debtor’s prison than let’s decide how best to do it. In 19th century England these prisons were open to visitors (visiting family, food being brought, etc), and many actually had modest furnishings that you would find in an apartment. Modern prisons would not allow this lifestyle. Also, if an auto loan corporation has to power to imprison its defaulted borrowers, then what about deadbeat dads who do not pay child support? What about the now millions of Americans who have defaulted on their mortgage and have lost their homes. The value of real estate far outweighs that of a car. Oh, and don’t forget defaulted student loans! What else shall we bring back from that era? Women as property, slavery, no protection for abused children, horrific prejudice? Debtor’s prison is simply incarcerating the poor for being…poor. How far we’ve come. I think a debtor’s prison could serve the purpose of deterring folks from being negligent. And those are the people I would be in favor of putting there. The people who are systemically unfaithful with their debt and money and who are not owning up to what is their responsibility.